PT Degree: CSU Fresno, 1990. Melinda has over 27 years of clinical experience with an emphasis in orthopedics, geriatrics, total joint rehabilitation and temporal mandibular dysfunction. 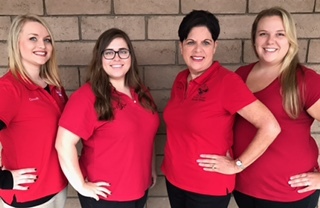 She has developed her skills with continuing education programs that have an emphasis in manual therapy, and also places her focus on patient education and community education. PT Degree: Master's degree, USC 1993 and Doctor of Physical Therapy degree, A.T. Still University (Mesa, AZ) 2012. Robin has over 24 years of experience. Robin's PT career includes extensive experience in geriatric orthopedics, vestibular/balance and wound care. She has completed a comprehensive eight month course though Polestar Education to become a Rehabilitation Certified Pilates Teacher and is a member of Pilates Method Alliance. Robin also specializes in treatment of osteoporosis. PT Degree: Doctorate degree, Pacific University (Forest Grove, OR), 2003. Mike has over 14 years of experience and focused his outpatient orthopedic treatment on spinal disorders, shoulder injury, post-operative conditions and geriatric rehabilitation. He utilizes exercise-based treatment approaches with an emphasis on posture and total body conditioning. Mike has also developed the "Back in Swing" golf rehab, fitness and performance program. Michael also specializes in neurologic conditions such as Spinal Cord Injury (SCI), Traumatic Brain Injury (TBI), Parkinson's Disease, stroke (CVA) and Multiple Sclerosis (MS). PT degree: CSU Northridge, 1984. Doctor of Physical Therapy degree: Rocky Mountain University, 2009. Andrea is a PT board certified neurological clinical specialist (NCS) with over 33 years of clinical experience. She has focused her energy on developing her skills and knowledge in the treatment of those suffering from neurological problems, with specialized skills in the area of stroke, spinal cord injury, brain injury, spasticity management, vestibular disorders and balance. Julie is a PT board certified Neurological Clinical Specialist (NCS) who joined The Rose Center in 2015. She has many years of experience in in-patient rehabilitation, primarily in the areas of neurological, geriatric and post-operative orthopedic rehabilitation. Her neurologic interests include stroke, Parkinsons and balance disorders. Julie also has some experience treating vestibular disorders. She graduated with a Bachelors of Science degree in PT from UCT in 2001 (South Africa) and worked in the UK prior to arriving in the US in 2003. Karen received her Bachelor's Degree in Physical Therapy in 1990 from the University of North Dakota and recently completed her Doctor of Physical Therapy from the college of St. Scholastica (Duluth, MN) in 2017. She has 28 years experience in both inpatient and outpatient settings and specializes in treating those with neurological diagnoses, including stroke (CVA), head injury (TBI), MS, Parkinson's Disease and spinal cord injury. She is a certified specialist in wound care and also specializes in edema management and wheelchair seating and positioning. 24 years practice and experience. Ralph graduated from Daemen College in Amherst (Buffalo), NY. Ralph brings his wealth of experience in outpatient orthopedic and sports medicine to The Rose Center. He specializes in differential diagnosis and orthopedic manual therapy of the spine and extremities. When not at work, Ralph enjoys spending time with his family: coaching U16 girls competitive soccer team, playing hockey and waterskiing. Ralph also holds a board position with the local youth soccer league, RYSL. Charllotte recently graduated from UCSF PT program in 2016 with her Doctorate in Physical Therapy. Charllotte enjoys working with patients who have a variety of rehabilitation needs, including orthopedic, geriatric and neurological. Charllotte has specialty training and certification in Myofascial Decompression, also known and referred to as "cupping", which was made mainstream this past Olympics with gold medal swimmer Michael Phelps. 20 years of practice and experience. Rob graduated from Chico State University in 1988 with a BA in Physical Education and is a certified Athletic Trainer. 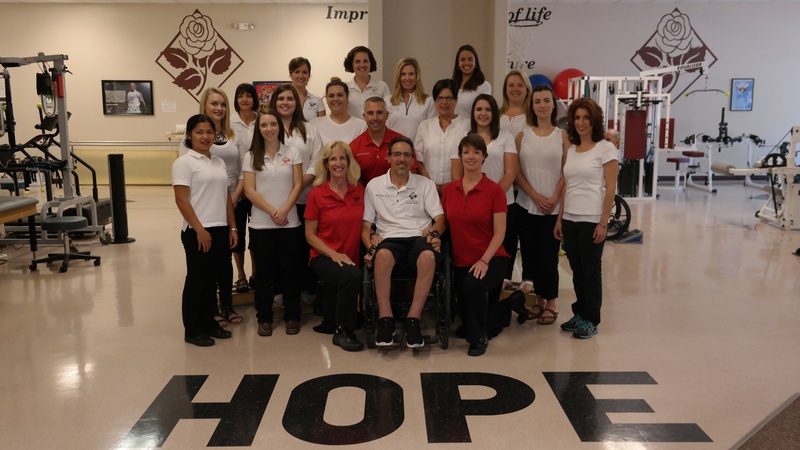 Rob is the co-founder of The Rose Center and is co-founder of The Roses 4 Hope, a non-profit organization developed in helping those with spinal and severe medical issues. Rob has first-hand experience with spinal cord injuries and rehabilitation. He enjoys working with orthopedic and athletic-related injuries, prevention and rehabilitation. 21 years of practice and experience. Lisa graduated from Chico State University with a BA in Exercise Physiology. She is the co-founder of The Rose Center and is co-founder of The Roses 4 Hope. Lisa has experience in outpatient orthopedics as well as balance-vestibular, and neurological rehabilitation. 23 years of practice and experience. Janet brings a wealth of knowledge, skill-sets and training to The Rose Center Physical Therapy team. She has experience in various practice settings and has specialized training in aquatic therapy and wound care. Janet is also a Polestar Certified Pilates Rehabilitation instructor and is a member of the Pilates Method Alliance. Nina recently graduated from College of Sequoias PTA program in 2016. Nina enjoys working with patients who have a variety of rehabilitation needs, including orthopedic, geriatric and neurological. Nina was a student at The Rose Center; she enjoyed her experience in the clinic and in the greater Redding area that she decided to move from Visalia to begin her professional career at The Rose Center.